Now is the time in the New Year when I start thinking about trying to eat more healthily and a grilled fish meal sprang to my mind. 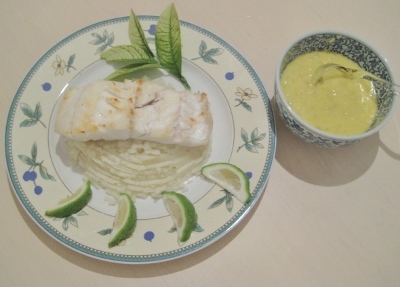 We have delicious fish here in the Cape and I thought that I would grill a piece of Kingklip (trans: pierre du roi). I hunted down a lovely sauce to accompany it. The original Beurre Blanc sauce was made in Nantes to accompany fresh salmon. Not all recipes that I make turn out exactly as they are supposed to. This sauce is supposed to be white and frothy but somehow mine did not come out that way however it was quite delicious, very creamy and slightly tart and a beautiful accompaniment to the fish so I did not worry as it tasted great. I served the grilled kingklip on a bed of lightly mashed potatoes to mop up the sauce. Place the fish in a bowl and drizzle the oil over it, leave to marinate for 30 minutes, turning from time to time. Chop 175g of the butter into small cubes. Peel potatoes then boil them until tender about 20 minutes. Drain, add a pinch of nutmeg, salt and pepper and crush. Keep warm. Chop the shallottts finely. If using spring onions, remove the green leaves and chop finely. Put 1 and a ¼ teaspoons of the vinegar in a heavy based saucepan and add the shallotts/spring onions. Simmer gently until golden. Add 4 teaspoons water, the rest of the vinegar, some salt and pepper. Simmer gently until liquid has reduced to 1/3. Turn grill on. Brush fish with the rest of the butter and place on a grid with a pan underneath to catch drops. Grill on both sides until golden brown and cooked through. Place mashed potato on each plate and make a low mound of it using the tunes of a fork to smooth it. Place a slice of fish over the potato. 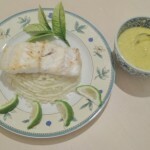 Pour the Beurre Blanc sauce into a separate bowl and serve hot with the fish. I recommend serving this delicious dish with a Sauvignon Blanc or Chardonnay.